Elevate Your Connection with the Road Ahead. Even before you start the engine, the 2018 MAZDA3 Sport evokes a feeling of anticipation for what lies ahead. 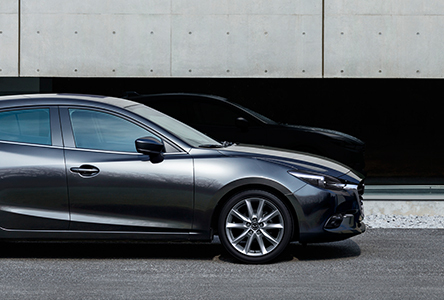 From the sculptural perfection of KODO design and elegant interior finishes, to the latest breakthrough technology and reliability tailor-made for the Canadian climate, the MAZDA3 Sport fuels your love of driving. You’ll enjoy a new level of connection between you, your MAZDA3, the road and the world. 50 years of Mazda in Canada means it’s time to celebrate. The MAZDA3 Sport 50th Anniversary Limited Edition was created so you can celebrate right along with us. Building on the MAZDA3 Sport GS, the 50th includes premium features like leatherette-trimmed upholstery, Bose® surround sound audio system with 9 speakers, CD player with MP3 functionality, Advanced keyless entry (proximity and ignition) and automatic climate controls. Quantities are limited. 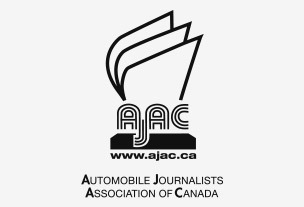 AJAC’s Best Small Car in Canada for 2018. The Automobile Journalists Association of Canada (AJAC) has voted the MAZDA3 Sport Best Small Car in Canada for 2018. It’s an incredible honour. 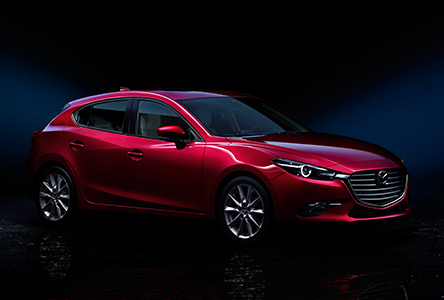 At Mazda, we create the MAZDA3 Sport with care, quality and craftsmanship. Features like SKYACTIV TECHNOLOGY, G-Vectoring Control and superb fit and finish go into making a vehicle that is not only cutting edge, but also a joy to drive. AJAC’s recognition is a testament to the vision of our engineers and designers and to those who love the drive. Engineering for the Real World. At Mazda, building strong and stable vehicles that deliver a better driving experience is our first priority. So we did the impossible: engineered a vehicle that never sacrifices performance for fuel efficiency. SKYACTIV TECHNOLOGY is engineering innovation that takes the entire car into consideration – from body construction and engine technology to chassis and transmission – to improve the overall driving experience. The high-efficiency 2.0 L and 2.5 L SKYACTIV‑G** engines deliver superb fuel economy, better torque than a conventional gasoline engine, and reduced noise and vibration. Our engineers created a precise, high‑performance automatic transmission that combines the direct, responsive feel of a manual transmission with the silky smoothness of an automatic. The SKYACTIV‑Chassis is engineered to be nimble at low speeds, yet stable at high speeds. We also engineered it to be light, allowing for a more direct and agile feel. Because we crafted an efficient structural design and used ultra‑high‑tensile steel in critical areas, the MAZDA3 Sport’s body is lighter than normal, yet it’s stiffer and stronger. The i‑ELOOP regenerative brake system‡ generates electricity to power the car’s electrical systems. That means that 100% of the engine’s power can be used for propulsion and you enjoy significant fuel savings. Winner of the AJAC 2017 Best New Innovation Technology Award, SKYACTIV-VEHICLE DYNAMICS with G-Vectoring Control (GVC) works behind the scenes to achieve a smoother, less fatiguing drive for you and your passengers by subtly adjusting engine torque, intentionally optimizing vehicle weight transfer during everyday commutes and spirited drives alike. The result is steering that is more precise and a ride that is more comfortable for drivers and passengers. Due to irregularities and undulations in the road surface, your vehicle does not always travel along the expected line, forcing you to make steering corrections. With GVC, your MAZDA3 Sport responds to driver inputs with fewer steering adjustments, so your vehicle behaves as you intend and you enjoy a more confident drive. Fatigue steadily builds as you continue to make minor steering corrections. GVC helps alleviate these corrections, especially over long distances. Plus, smooth transitions between G‑forces suppresses head and body sway, allowing for a more comfortable ride for you and your passengers. The Evolution of Passionate Design. For Mazda engineers, creating a car that’s sporty, practical and exhilarating to drive simply isn’t enough. They want to enliven your driving experience. The 2018 MAZDA3 Sport offers elegant interior touches, such as a beautiful yet easy-to-read instrument cluster, available leather seating and soft-touch materials throughout – just a few of the details that transform the status quo. 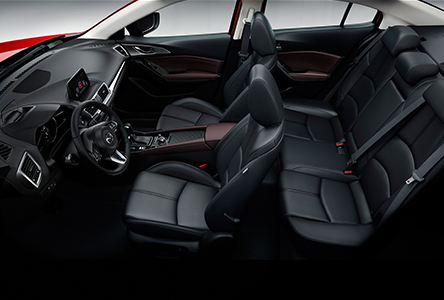 All designed to allow you to relax and revel in pure driving enjoyment. The refreshed cockpit ensures intuitive driver-oriented engagement. High-end touches include an available heated, leather steering wheel‡‡, stylish instrument cluster design and elegant dashboard decoration panel. The available colour Active Driving Display (ADD)† projects critical driving information directly in your field of view allowing you to keep your eyes focused on the road. Mazda designers enhanced exterior noise control using a matrix of sound‑deadening materials, tighter body gaps and improved sound insulation. The result is a quieter ride that lets you hear your music better – or just enjoy the peace and quiet a little more. Can a Car’s Looks Impact how it Feels to Drive? In crafting the MAZDA3 Sport, Mazda engineers examined every curve, every line and every angle to achieve bolder, more dignified proportions. With a uniquely low, wide and stable stance, the MAZDA3 Sport is more than just beautiful. It’s also aerodynamic, delivering a very low coefficient of drag with improved performance and handling. The KODO Design headlights are not only striking, but provide a sharper vision of the road. The available LED headlights with signature lighting††, LED fog*** and tail lights†† are a beautiful way to illuminate your journey. The sleek front grille and signature wing give a stronger, three-dimensional appearance and depth, evoking the desire to get in and enjoy your drive, even from a distance. To achieve a greater level of precision and artistry, Mazda engineers sculpt every design in hard clay rather than solely rely on computer‑aided design. It’s a level of craftsmanship that might seem extreme, but we wouldn’t build anything less. Can the perfect drive be defined by what doesn’t happen? Yes. Avoiding an accident in the first place is always the safest route. With many features now standard on the GS and GT models, i‑ACTIVSENSE helps you focus on what really matters – the road ahead. These high-end safety innovations alert you to hazards so you can better avoid collisions, or lessen their impact. It’s how we engineer confidence. Simply preset the vehicle speed and distance and the available MRCC† will work within a set speed range to help you maintain a safe distance between you and the preceding vehicle, down to 30 km/hour. SBS† can help avoid or reduce the severity of a collision at speeds above 16 km/hour and will alert the driver and apply the brakes in the case of an impending collision. By detecting vehicles ahead, FOW alerts the driver to an approaching risk of collision early enough for the driver to take evasive action. When it senses a potential unintentional lane departure, LAS† will perform minor steering corrections to help guide your vehicle back to the centre of the lane. The Traffic Sign Recognition‡ uses cameras to read road signs such as speed limit, do not enter and stop signs♦♦. The colour Active Driving Display shows this information so you can stay informed without taking your eyes off the road. The Advanced Blind Spot Monitoring‡‡ sensors detect objects in the left or right blind spots. If the driver signals a lane change while an object is present, a light in your corresponding side mirror blinks and a warning chime sounds. When travelling at speeds between 4–30 km/hour, SCBS††† detects objects ahead and prepares the vehicle by adjusting brake pads closer to the disc. If no driver action is taken, the system automatically applies the brakes. AFS‡ helps you see around corners at night. As you turn into a corner, the headlights pivot up to 15 degrees in the direction of your turn, improving visibility and allowing you to spot potential hazards and dangers ahead. When backing up, Rear Cross Traffic Alert‡‡ detects a vehicle approaching from the side and promptly alerts the driver with both an audible and visual warning in both the side mirror and 7-inch touchscreen display, and on the colour Active Driving Display, when equipped. Get Away Without Missing a Thing. The 2018 MAZDA3 Sport comes with options to keep you entertained, informed and connected, no matter where you’re headed. Enjoy connectivity features such as the available HMI Commander that allows you to easily control everything from navigation to audio with controls placed at your fingertips. There’s also an available SMS text readout feature, and USB and auxiliary audio ports come standard. MAZDA CONNECT makes staying informed and entertained effortless. Features such as audio, hands-free phone, and available navigation are easily controlled using the convenient, multifunction HMI Commander control. Custom-built for the MAZDA3 Sport, the available, premium 9-speaker Bose® sound system▲ enables listeners to enjoy a surround sound experience from nearly any stereo source, including CDs▲, MP3 devices, radio broadcasts and the available SiriusXM™ Satellite Radio‡. Explore new music and infotainment options via your Bluetooth®-enabled and internet‑connected device. With hands‑free phone and audio streaming, you stay entertained while streaming audio from your compatible mobile device. 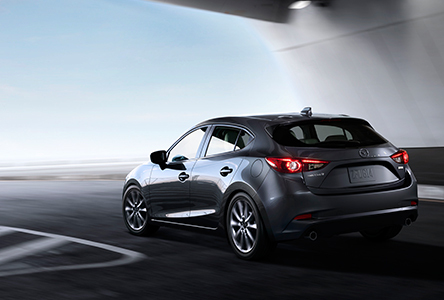 The MAZDA3 Sport GT with Technology Package comes with a free trial subscription for SiriusXM™ radio. Now with an even larger music library, subscribers enjoy 120 channels of commercial-free music, plus the biggest names in talk, sports, comedy and entertainment and world-class news. The available integrated navigation system‡‡‡ offers the advanced features of today’s navigation devices, including voice commands and advanced lane guidance. Plus, getting around town – or out of town – has never been easier thanks to the system’s 3D interactive map with step-by-step audio directions. ◆Estimated fuel economy on the Mazda3 Sport GX and GS with manual transmission. Estimated fuel economy based on Government of Canada’s approved, revised 5-cycle testing method. Your actual fuel consumption may vary depending on how, where and when you drive. **The 2.0 L SKYACTIV-G engine is standard on the GX, GS and 50th models, and the 2.5 L SKYACTIV-G engine is standard on the GT model. ‡Available on the GT model with Technology Package. †Available on the GS model with i-ACTIVSENSE Package and the GT model with Premium Package. ††Available on the GS model with i-ACTIVSENSE Package and standard on the GT model. ***Standard on the GT model. ▲Available on the GT model with Premium Package. ‡‡Standard on the GS, 50th and GT models. ‡‡‡Available on the GT model with Premium Package and available as an accessory on GX and GS models. ◆◆TSR functionality may not be compatible with all regional road signs in Canada.